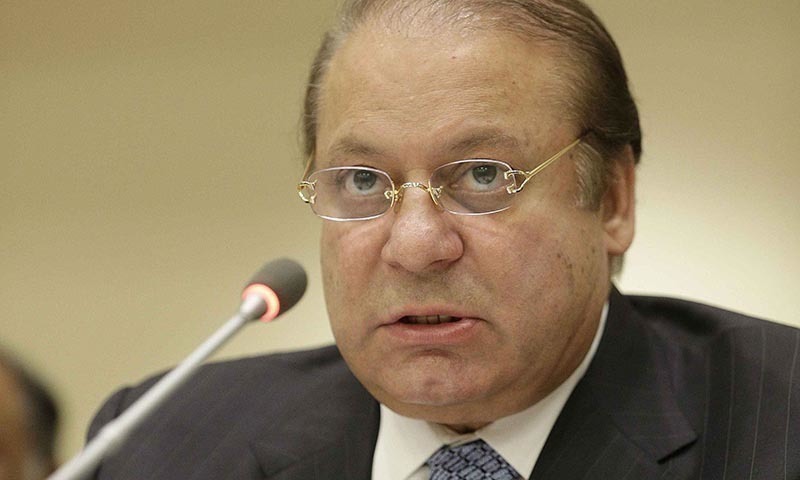 “I am equally grieved as you are, deeply saddened and regret this incident," says former premier Nawaz Sharif. ISLAMABAD: Former prime minister Nawaz Sharif expressed regret over the assault of a private television channel cameraman and said the behaviour of his security guards had damaged his reputation. Journalists staged a protest on the arrival of Mr Sharif in the accountability court on Tuesday. “Such acts are uncalled for and cannot be tolerated by any means. I will take every possible step to take the culprits to task,” he added. However, he said the media should also adopt a mechanism of its own accountability. so the initiator is cameraman and not the guard. Take the culprits not to 'task' Mr. Sharif, but to the police! Saw the video, it was horrific. 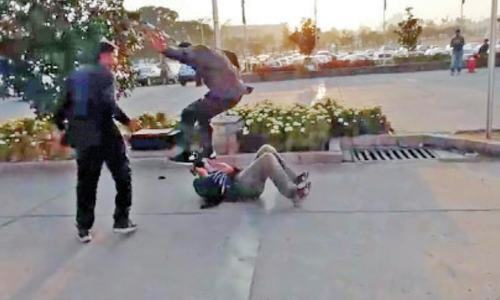 Attacking a camera man, by running over and then kicking on his head, unbelievable. A security guard is never trained like that by a security company. They just limelighted you actual reputation. Yeah right. Why didn’t you step out of your SUV to check on his condition when he was lying down. You clearly saw the assault. What reputation? Of looting the country’s wealth? This lip service is useless. Too late. So he's more worried about his reputation than the cameraman who was badly Injured by his guard? @Mohan, MSB comes to mind. His reputation make me laugh. These thieves have reputation , honor and respect! Joke of the day! The Nawaz family security guards or Shahbaz family is all the same. @Justin, .... The security guards were angry because they would be out of a good job when Nawaz goes to prison. Looks like he hired a bunch of goons to protect him. what reputation do you really have now?? Too little too late. Law will take its course now. Nawaz should have acted sooner. Liar. Nawaz is responsible for this. He order Security guard to attack cameraman. Shame. Not even remorse for the cameraman, just worried about his own reputation. Nawaz has no morals or scruples. I hope this corrupt example of humanity gets put away for a long time in the avenfield ref case. If he is as popular as he would like us to believe, why does he need security everywhere he goes? I accept ex PM Nawaz's explanation. It appears that the action of his security guard was in retaliation of a personal nature and not an extension of his professional duties. Thieve of billions is worried about his reputation. Why not first provide the money trail of your illegal assets and companies? Do us a service...leave us be. By looking at your answer of one of the reporters I don’t think you looked that grieved Mr ex-PM. No doubt this shows how you were ruling this country for the last many years. For some reason, security (private guards, bouncers, malls and shopping centre guards) all over the world tend to think they are somehow allowed to use excessive force against the public. Mr Nawaz Sharif, You do not have a good reputation any way and what your guard did just showed your feelings towards the general public. Sharif Saheb, your guard treated a member of public like an animal... this is shameful!! The security guard did not damage your reputation, in fact, he has added in your reputation that you have always 'Gullo Butts' with you. This speaks the mindset of PMLN and the people surrounding you. These people will not mend their royal ways. Yes...We all know how Honest and Sincere you You. Where is the Car and Driver that killed the Boy!!!! @Sameer, pls, don't suggest him leave without facing the law. By the way, he would already be desiring so. It's only PTI government perhaps which is an obstacle between him and NRO. So, more one should ask him to leave silently. your guard , your employes represent the owner's mind set. digs do the bidding of the master. Why does he need personal security guards in National Assembly premises. I did not know Mr NS has a sense of humor. Simply, corrupt mafia leaders employ guards for security reasons and train them to protect at any cost - this is exactly what happened, so Nawaz Sharif is equally involved as 'master' and should be charged for negilance, having dangerous security guards and badly injurying a camera man, who was trying to do his job. I say to home secretary: please take stringent and severe actions against culprits and their masters, otherwise, PTI's reputation will damaged. You are not equally grieved Mr. Nawaz Sharif as you tried very hard to cover the violent act of the guard by saying that the cameraman hit the guard first. His reputation is a world known money launderer not a fighter. 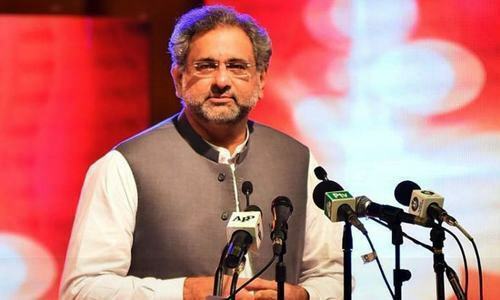 Your reputation is such that cannot be damaged, it’s preserved for life, we all know all too well who you are and what you stand for, Mr. three time PM and disgraced all theee times. Sorry, I meant the guy who hit the camera man. This guy gets worse with every day that passes. Has he ever heard of the word "sorry" or handing his security guys over for action by the authorities. Forget about it and donot engage in discussing such issues.